This week I’ve worked solidly on this baby hoody for a co-worker. It’s missing some buttons, but I hope to rectify that in the next couple of days. So far, I’m thrilled with the result! The pattern was well-written and clever, not a seam in sight. 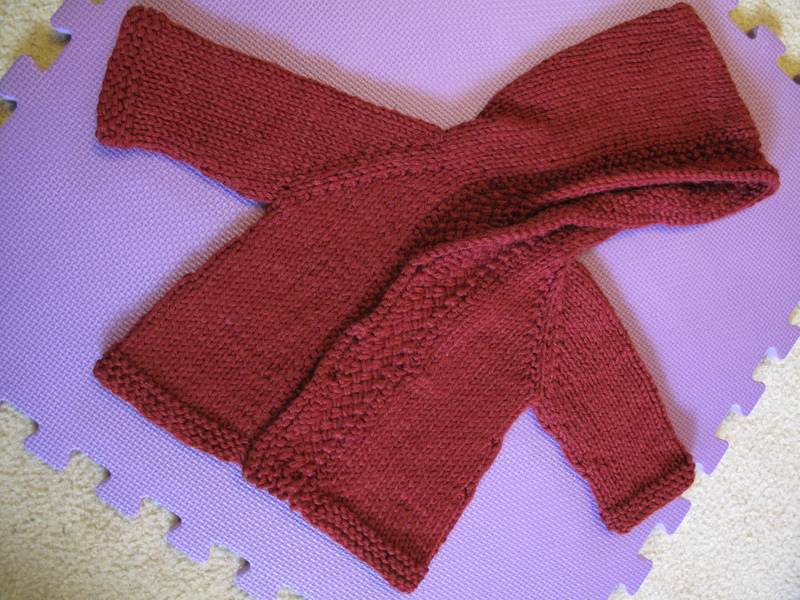 The knitting began at the very top of the hood section using Judy’s Magic cast-on… clever huh? … and do you recognise the yarn? The yarn was left-over from making my Silvi Coat, Cleckheaton Country Wide. I managed to locate a little over 5 balls. I was rapt to have put them to good use, but I wish I had just one more ball. I had to skimp on 2 rows in the woven band and I had to forego a pocket. Boo hoo. But alas I don’t think it’s a major tragedy. Now back to Still-light… still going. It’s times like these I wish I had a magic wand.